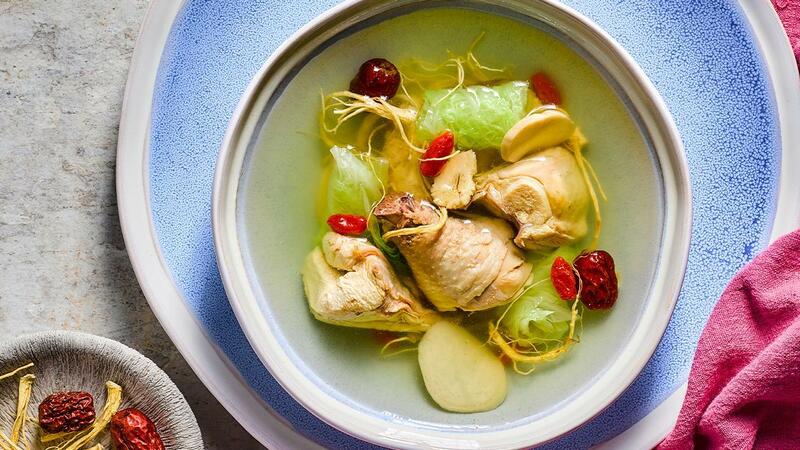 The double-boiled chicken soup is a timeless Chinese classic for many families. Indulge in this highly nutritious soup that packs in the goodness of chicken, scallops, cordyceps and hairy gourd. Heat up water in stock pot. Add in Basic Stock Reduction, Concentrated Chicken Bouillon and Chicken Seasoning Powder, simmer for 5mins. Blanch and rinse kampong chicken. Set aside. Prep all other ingredients – hairy gourd, red dates, cordyceps flowers, dried scallops, dried cuttlefish, apricot kernels – accordingly. Add all ingredients and stock base into a large ceramic/porcelain soup pot. Double boil in steamer for 3hrs.